This blog is about pintle injector used in Space X Falcon 9 rocket. As a part of my Masters theisis, I have fabricated several pintle injectors and tested it in propulsion lab. This blog is intended to simplify the efforts of rocket propulsion enthusiasists to easily grasp and fabricated an injector for their rocket engine. Injector as the name implies, injects the propellants into combustion chamber in the right proportions and right conditions to yield an efficient and stable combustion process. It also performs the structural task of closing of the top of the combustion chamber against the high pressure and temperature it contains. An injector has been compared to carburetor of an automobile engine. However, the injector, located directly over the high pressure combustion chamber performs many other functions related to the combustion and cooling process and is much more important to the function of the rocket engine than the carburetor is for automobile engine. No other component of a rocket engine has as great impact upon engine performance as the injector. The measure of delivered performance (specific impulse) is the number of pounds of thrust provided per pound of propellant consumed per second. Each percentage point loss in combustion efficiency means a loss of same magnitude in overall Is Propulsive efficiency. High levels of combustion efficiency derive from uniform distribution of desired mixture ratio and fine atomization of liquid propellants. Local mixing within the injection-element spray pattern mixing within the injection-element spray pattern must take place at virtually a microscopic level to ensure combustion efficiencies approaching 100%. Combustion stability is also very important requirement for satisfactory injector design. High performance can be secondary if the injector is easily triggered into destructive instability. At times, it may be seen that the design requirements for stability are counter to those for performance, since many of the high performance appear also to reduce the stability margin. Stable operation will depend in good part on the injector element selected and provision for damping any oscillatory phenomena. 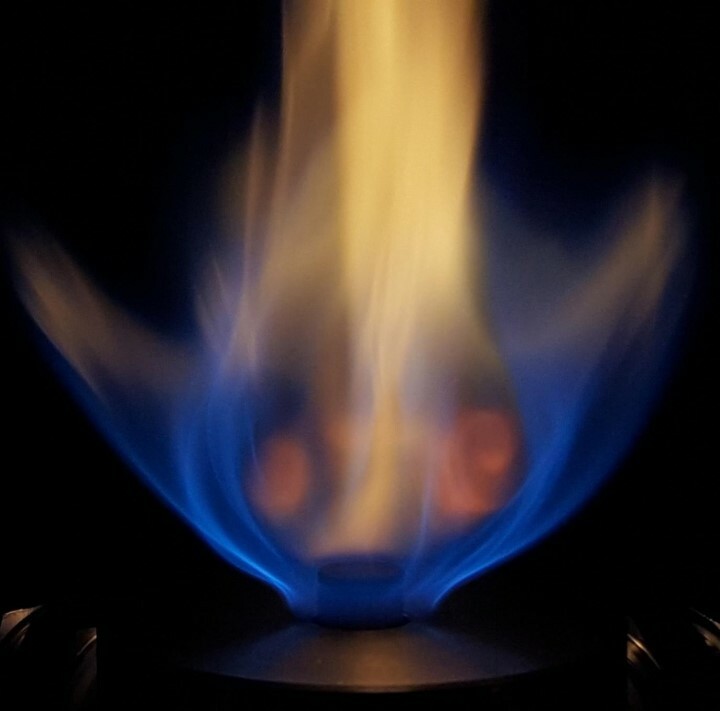 All systems that releases large amounts of energy have the potential for destructive oscillations, particularly if there is regenerative feedback (gain) between the combustion phenomena and the rate of energy release. This is true of the combustion process, because the temperature and pressure variations can directly impact the rates of vaporization and reaction. Stable operation can be achieved by either damping or detuning these processes. Mass distribution is another important design parameter for successful injector/combustor interaction, can be difficult to achieve truly uniform fashion across the injector face. Good injector design includes a computation of the effective mass distribution and an assessment of design accuracy in this regard. Mixture ratio distribution also plays an important part from the stand point of both performance and chamber compatibility. With combustion chambers made of metals (copper, nickel, steel) that are fuels, it is important to avoid the scrubbing of chamber walls by high temperature oxidizing streams. Most injector patters are designed to avoid this possibility and generally provide an excess of fuels to the above mentioned areas. Text is available under the Creative Commons Attribution-ShareAlike License.. Simple theme. Theme images by gaffera. Powered by Blogger.